Allows you to move freely around the stage or audience and continue to hear the monitor mix. As part of the 2nd generation of Galaxy Audio's Any Spot UHF Wireless Peronal Monitors, the AS-1100 features a new technology and design. Wireless Personal Monitors are effective at eliminating stage noise, protecting users' ears from damage, allowing the user to move around the stage or audience and continue to hear while eliminating feedback. The AS-1100 is easy to use and replaces floor wedges and the amplifiers that power them. Simply plug the AS-1100 into a 'monitor out' jack on the mixing console, create the desired mix, and it's ready to deliver quality sound. It has 120 selectable UHF frequencies to help locate the best and clearest signal to transmit. 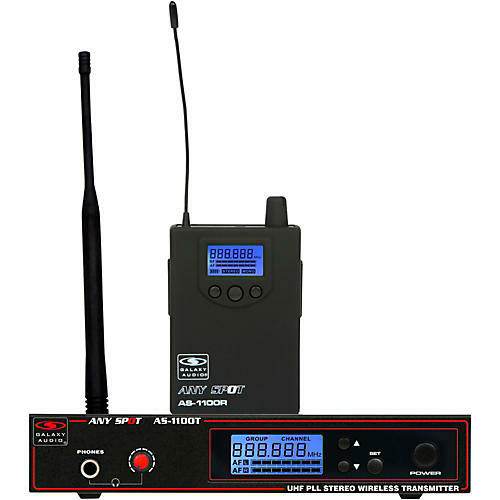 The included AS-1100T transmitter is selectable to either mono or stereo. The AS-1100T has two XLR/1/4" combo jack for its inputs, stereo/mono switch, headphone output, volume control, and LCD display. The transmitter includes a single rackmount kit, for mounting 1 unit in one rack space. A rack tray is available for mounting two transmitters side by side in one rack space. This system operates within the D range of 584-607 MhZ. The included AS-1100R receiver features a 100mw headphone amplifier with a standard 3.5mm (1/8") headphone output. The AS-1100R is sure to be plenty loud for any environment. The receiver has a built in limiter and LCD display. The Any Spot Series of Wireless Personal Monitors is a great alternative for performers who are tired of lugging around heavy and bulky floor monitors and tired of leaving a gig with ringing ear. Ideal for anyone looking for their first system or wanting to upgrade to the next level. Order now!